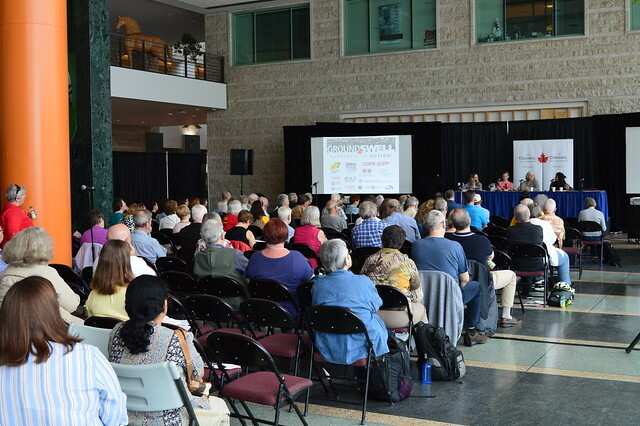 In 2018, the Council of Canadians’ Annual Conference was held in Canada’s capital, Ottawa, Ontario. We brought together chapter activists, supporters and allies for a dynamic weekend event that included a public forum, workshops, plenary panels and more. Every day Canadians face the reality of the Trudeau government’s broken promises. From its failure to protect lakes and rivers from Big Oil, to meet internationally-stated climate pollution reduction targets, to provide true consultation on “free trade” negotiations, to make our electoral system democratic, and to fully implement the rights of Indigenous peoples – promises have been made, but not kept. So how do we turn awareness of these broken promises into action? It’s simple: we come together to create a groundswell of people power. By working with civil society groups, labour, Indigenous peoples and others we can put forward a positive vision of a better tomorrow and act on it. Together, we hold the power to bring about the better Canada and fairer world we know are possible. The Council of Canadians expresses its deep gratitude to our conference sponsors who have helped make Groundswell 2018: Awareness to Action possible.